I knew about flexing and bending horses for quite a while before I really understood its proper place. I wish for the horse’s sake, it hadn’t taken so long. When I did begin to use flexing right, it made a big difference in my horses. I didn’t understand all that it meant to the horse until I read Bill Dorrances book True Horsemanship Through Feel, he explained it in such a way that it made since. Flexing your horse, whether its putting his head down or side to side, really puts a strong foundation in – a foundation based on feel and respect. Without this base, there may be some spots “just show up” later. I like to get this stuff really good and strong right from the start. I know each horse is different, and there are some other steps we might have to do before we get to this one (i.e. haltering or getting the hindquarters ,) but I like to have this one built in first, if possible. 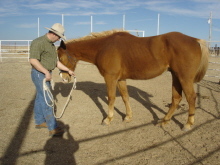 Like in the picture above, when the horse gets on to this, there is a real softness that comes in, and he’s ready to learn. These are the steps I use to get this working for me. 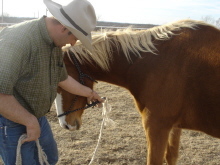 I put my hand on the halter lead rope where it connects with my thumb down. This is something that comes in handy -- really handy when you’re on his back. With his head lowered, ask him to tip his nose to the left or right. (A little pointer here – make sure you give him room to do this. It’s very natural for the horse to think you’re in his way when you are!) A lot of people crowd their horse, and then wonder why he doesn’t respond to their feel. When you’ve worked around him with feel, he’s learned to respect you, and he won’t just swing his head into you – even when you ask him to. Remember to think about your body position in relation to the horse. You’re looking for the horse to put his head down and tip his nose to the side you ask him to. All the while, being soft and quiet. Now, if he’s doing this, he’s ready to move on. You’ve taught him to lower his head, tip his nose, or flex to the side, while keeping his feet still. 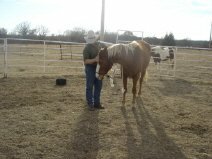 All this is teaching your horse to follow your feel. Now we’ll connect a feel to his feet. 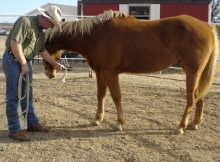 With your hand on his halter/lead rope (thumb down,) you’ll ask him to lower his head and tip his nose over the foot that needs to move. Offer a feel (pressure on the rope) to back. You may have to let him search; he may wiggle and arrange himself until he finds what you’re offering. Be patient and reward the slightest try. The reason we tip his nose over the foot we are trying to move is to help him get his weight off of it. When your horse picks up the feel and begins to move that foot, quietly (his head hopefully is staying down for you) tip his nose back to the center. This can help him put his foot all the way down, and pick up your feel to stop (he has to put weight on that foot in order to stop). When the horse is doing this, he is really picking up your feel. You should be picking up on his as well. Now, we’ll take it back to the center, and I’ll ask him to stop. I will then position his head to the right for the right foot. Notice, right foot is forward. I’m asking him to step it back, his head is tipped over the right side. A recipe for success. All this really helps the horse learn to position himself to follow your feel. He learns to wait for you. This waiting for your feel to move or adjust, builds respect and confidence in your horse. (And you as well!) These exercises can, and should be done from the horses back later on down the line. Spend some time thinking about these things before you do them. 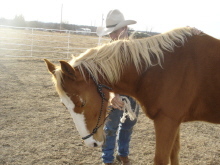 Develop a clear picture in your mind of what you want before you ask the horse. When you have this foundation stone laid in place, you’re really ready for some of these other things like leading up free , and freeing the hindquarters. For questions about flexing and bending, please contact us.